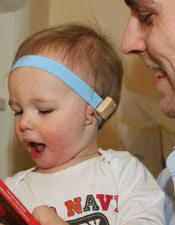 Who are our babies with hearing loss? Fewer than 15% of the babies identified by Early Hearing Detection and Intervention (EHDI) programs have bilateral profound hearing loss (deaf) and more than 50% have mild bilateral or unilateral hearing loss. The distribution of degree of hearing loss in diagnosed infants is depicted in the following figure. Fewer than 1 in 20 newborns with congenital hearing loss have two parents who are hard of hearing or deaf. 1 Therefore, most families of these children have little or no knowledge of hearing loss and its potential impact on language and speech development, social skills, and future academic and life success. The following information will share recent research findings about the needs of these children and available materials to assist early interventionists and families facilitate good early childhood development outcomes.